Kids really enjoy rock tumbling. They love creating tumbled gemstones, discovering the mystery of what happens in the tumbler barrel and always anticipate the day when the barrel will be opened. Kids can learn a lot from rock tumbling. They will learn science lessons about rocks and mechanical weathering. They might also learn about making jewelry and using tumbled stones in crafts. However, the most important lessons might be those of "patience" and "following instructions carefully". Rock tumbling involves using electricity, carefully following instructions and using a machine with a motor and moving parts. Some tasks, such as opening a tumbler barrel may require strength and dexterity that is beyond the abilities of a child. Also, operating a tumbler includes the responsibility of checking it a couple times per day to be sure it is operating properly. Close adult supervision is required to do the activity safely and to obtain good results. Rock tumbling provides a great opportunity to do something fun and educational with a child. Take advantage of that. Sharing your time with a child can be the most important gift you can give. It is likely that you will enjoy the activity as much as the child does! If you purchase a rock tumbler for a child be sure that you or another responsible adult (who is enthusiastic about doing this activity with the child) is available to supervise and participate in every step of the tumbling process. See our "instructions for rock tumbling" to learn about what is involved. 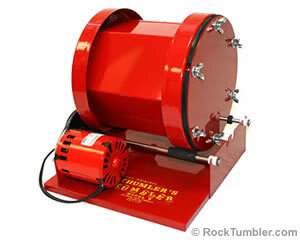 This is the Thumler's A-R1 rotary tumbler. It is a small hobbyist-quality tumbler that is great for a beginner. Adult supervision will be needed because the tumbler has an electric motor, moving parts and a barrel that requires a bit of strength to open and close. An adult should have the responsiblity of checking the tumbler every day with the child to be sure that it is running properly. The adult will also need to be present every time the tumbler is started or opened.. This requires a commitment by the adult. 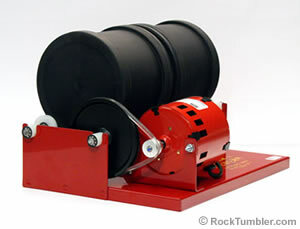 Rock tumblers are small machines with electric motors and moving parts. Adults should closely supervise children to be sure that they are cautious about electricity and the moving parts of the machine. The rock tumbler is going to run for a month at a time and should be located where small children and pets will not disturb it. Many people run their tumbler in a closet, a basement, a garage or a shed where it will not be disturbed. Be sure to place it where you can easily check on it at least a couple times per day and where the noise will not be a disturbance. We have an article titled: Where is the Best Place to Run a Rock Thumbler that you might find helpful. The rock tumbling process has several steps that must be followed carefully for successful results. Continuous adult supervision is needed to be sure that the tumbler is filled properly; grits are carefully measured; used in specific sequences; rocks and barrels are cleaned thoroughly; and tumbler mud is not poured down a drain. These are just a few of the tasks that should be either done by the adult or done by the child with adult supervision. Not pouring used grit and tumbler mud down a drain is an important part of the instructions. A supervising adult will be sure that these instructions are followed. We believe that the Thumler's MP-1, Thumler's A-R1 and Thumler's A-R2 machines are good tumblers for use with a child under close adult supervision. The machines are easy to use and easy to understand. The Thumlers MP-1 and A-R1 are the most popular tumblers that we sell for use with children. They are both small, easy to use rotary tumblers - but there is a price difference between them. We compare these tumblers side-by-side in this article. Tru-Square Metal Products has been producing the Thumler's Tumbler for over fifty years as a family-owned business. They have produced hundreds of thousands of tumblers. Thumler's machines run quietly, produce nice tumbled stones and are very easy to use. We own two A-R2 tumblers and have tumbled many batches of rock in them. They have given us years of great service, lots of fun and plenty of nice gemstones. 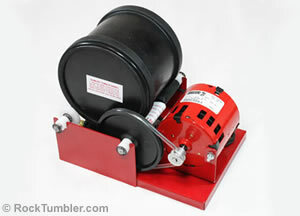 This is the Thumler's A-R2 rotary tumbler. It has two small capacity barrels that tumble about two pounds of rock each. If you have two kids this will allow each child to have his/her own barrel. Or, if you have one child then you can have a barrel too! Our recommendations for kids tumblers are the small tumblers with two-pound or three-pound capacity barrels. Larger tumblers require more strength and are more difficult to handle. Vibratory tumblers require greater skill and understanding. They are recommended for adults who are mechanically inclined. If an adult asks us: "I am new to this hobby, which tumbler should I purchase?" We will recommend a small-capacity tumbler such as the Thumler's A-R1 and Thumler's A-R2 machines. These tumblers have a low initial cost and low operating cost. They are also durable machines that will last a long time. You can purchase a small tumbler - with supplies - for a little over $100. However, a large capacity tumbler can cost over $200 and require over $100 worth of rough and supplies each time you run it. We suggest buying a small tumbler to try rock tumbling. You might decide that a small tumbler is all that you need. If you don't continue with the hobby your loss is small and you have a nice beginner's machine to give away. If you decide to buy a larger machine you still have a nice small machine to experiment with, use with your nephew, give to a friend or use to polish small batches of special materials. This is the Thumler's A-R2 rotary tumbler. It has two small capacity barrels that tumble about two pounds of rock each. A two barrel tumbler allows you to tumble two different types of rock at the same time or two barrels of rock at two different stages in the tumbling process. It is also a great tumbler for two people to share. Do You Have a Source of Rocks? If you have a source of rocks to tumble then a large capacity tumbler might be just the thing for you. Some of our customers live in the Pacific Northwest where streams containing agates flow across their property. Some live in Arizona or Texas where they can walk their property and find nice pieces of jasper. Others live near the Great Lakes and can walk across freshly plowed fields and find Lake Superior Agates. These folks are really fortunate because the cost of buying ten pounds of great tumbling rocks can easily be $60 or more. Then add the cost of grit and you can easily spend $100 to tumble a load of rocks in a large-capacity tumbler..
Great tumbling rough typically costs at least $5 per pound and if you want to purchase really good material the cost can be a lot more. A person who can collect his or her own rough can save a lot of money. If you have a source of rough rocks or can afford to purchase them. Then a large capacity tumbler might be perfect for you. The Thumler's Model B and Thumler's A-R12 tumblers are wonderful larger machines. They are quiet, have reliable motors and will last for many years under normal use. This is the Thumler's Model B rotary tumbler. It is a large-capacity tumbler that can process about ten pounds of rock at a time. This is a great tumbler for anyone who is able to collect their own rough, can afford to purchase their rough or who wants to process a lot of material. It has a soft rubber barrel that reduces the amount of noise produced and is water tight. We really like vibratory tumblers. They tumble rocks in less than 1/2 of time required by a rotary machine and they use a fraction of the amount of grit and polish. If you read our article about the Lot-o-Tumbler you should be able to tell how much we enjoy using it. However, vibratory tumblers are trickier to operate than rotary tumblers - you need just the right amount of water, just the right amount of abrasive and then keep a close eye on them while they are running. We didn't get great results right away - it took a little experimentation - but it was really worth the work once we figured it out. Be prepared to experiment! This is the two barrel Lot-o-Tumbler. It is a large-capacity vibratory tumbler. Vibratory tumblers are wonderful machines for rapidly processing lots of tumbled stones. However, they require some learning and patience to get good results and they make a little more noise than a rotary tumbler. 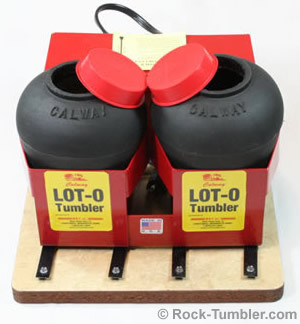 If you buy a Lot-o-Tumbler it must be glued to the floor or to something really heavy like a concrete block to keep it from walking across the floor. All of this glue and experimentation is a bit more than anyone who doesn't have a passion for tumbled stones might want to do. However, if you are not afraid of the work and gluing a $200 machine to a concrete block then a vibratory tumbler might give you a lot of enjoyment!